British shopping chain John Lewis has released “The Other Half”, a television commercial telling the story of two people falling in love, one in 1925, the other in 2012. 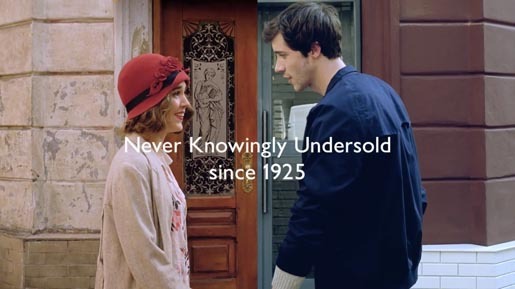 1925 was the year John Lewis made its life long commitment to “Never Knowingly Undersold”. By bringing their two worlds together as one, we show that falling in love, and embarking on a relationship, is a universal story which will keep being replayed throughout time. While many aspects of our lives today are very different to almost a century ago, the really important things haven’t changed at all. The soundtrack is a cover of the INXS song, Never Tear Us Apart, re-recorded by Paloma Faith. The Other Half ad was developed at Adam&EveDDB, London, by creatives Ben Priest, Ben Tollett, Emer Stamp, Aidan McClure, Laurent Simon, Shay Reading and Frank Ginger, agency producers Matt Craigie and Victoria Keenan. Filming was shot by director Ringan Ledwidge via Rattling Stick, London, with producer Sally Humphries, director of photography Ben Seresin, production designer Nick Foley-Oates, production manager Lucy Booth, costume designer Natalie Humphries. Post production was done at The Mill, London, by VFX producer Gemma Humphries. Editor was Rich Orrick at Work Post. Music, “Never Tear Us Apart”, performed by Paloma Faith, was licensed by Leland Music.